Insights with cargo-carrying capacity that exceeds 75,000 cubic meters and being built by Samsung. Type ‘A’ prismatic tanks that are fully refrigerated and utilize 35,000 cubic meter ethane/ethylene gas-ships to be built at the ships’ hulls as secondary barriers to contain any cargo leak. China’s Jiangnan Shipyard for the UK-based Navigator Gas. 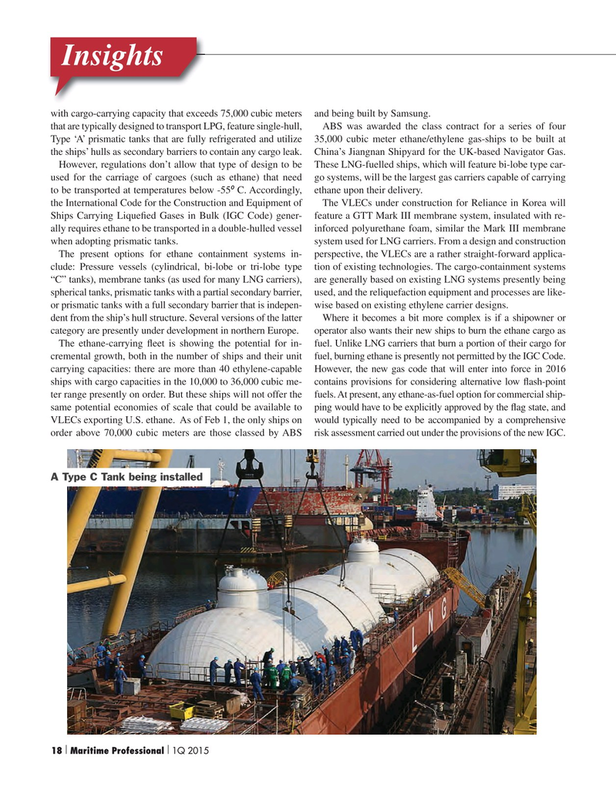 However, regulations don’t allow that type of design to be These LNG-fuelled ships, which will feature bi-lobe type car- used for the carriage of cargoes (such as ethane) that need go systems, will be the largest gas carriers capable of carrying to be transported at temperatures below -550 C. Accordingly, ethane upon their delivery.